As those little ones continue to build up their vocabulary past kindergarten, you'll want to prepare a number of useful resources to facilitate their learning. Do you know many compound words for first grade? If you need some to teach a lesson or to explain them to your students, then this article will definitely help. There are some games, worksheets, and online resources for you to use. Putting it simply, a compound word is made by putting two words together to form a single word. The resulting compound word may have a meaning that cannot be determined directly by examining the two constituent words. There are many compound words for first grade that students of that age can easily understand and enjoy working with. Following are several fun activities and worksheets for the classroom that are appropriate for this level of learning. There are 20 compound words at First School Years that are appropriate for first grade students. Apples4TheTeacher has word search games with compound words that you can print out for classroom use. In addition to the matching games above, you may be interested in some more formal materials for teaching compound words to the children. 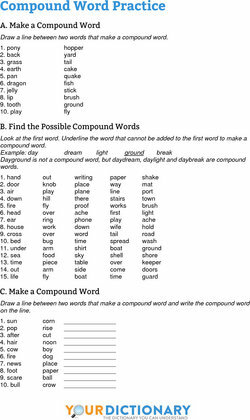 Provided here is a printable PDF worksheet that has practice questions for compound words for first grade students. Simply click on it to download to your computer, and then print it as many copies as you need. The answers for the questions on the worksheet above are as follows. One of the most important lessons you can teach first-graders is that learning is fun! When helping them with understanding compound words, be sure that they're having a good time. This will pave the way for a lifelong love of learning, so when they have to tackle intransitive verbs and the past perfect tense, they'll approach them with enthusiasm rather than disdain. 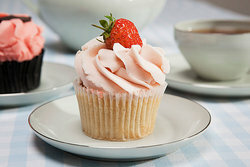 Cupcake is a compound word. "Compound Words for First Grade." YourDictionary, n.d. Web. 24 April 2019. <https://education.yourdictionary.com/for-teachers/compound-words-for-first-grade.html>.